After a short summer break we are back in London waters at none other than our very own Bar&Co moored boat, Temple Pier. 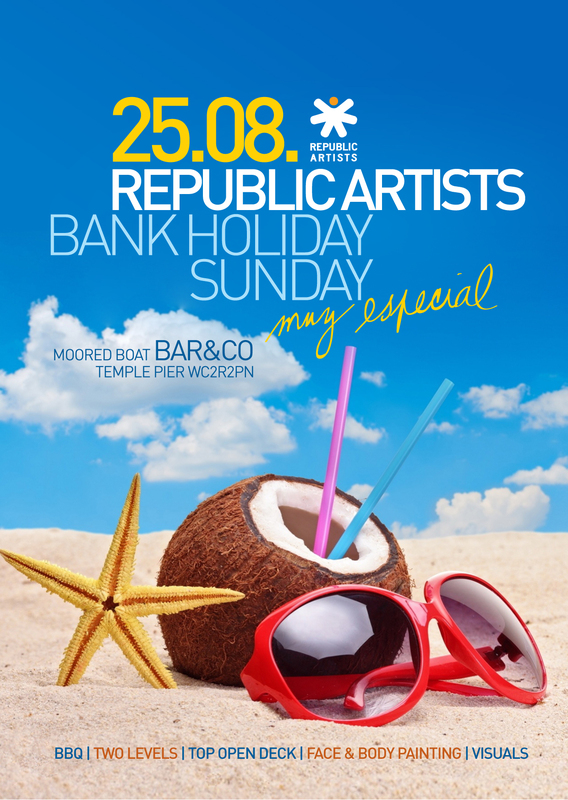 From 5pm the doors are open, expect to enjoy chilled music and chilled drinks. A BBQ selection will be available on the open top deck served by Captain Peter, suiting meat and veggie lovers alike. After sunset we will move to the lower deck of the boat. The party will carry on till 3am with the house and techno soundtrack supplied by RA residents & Ian C, a producer and We Love Space resident percussionist. On this occasion we have added extra attractions, make sure you come early so you don’t miss out!! Boat capacity is very, very limited. (Over 100 ppl) we expect to be sold out well in advance so get your tickets early. You know the drill!! For those of you who want to carry on partying we will be giving away £5 wristbands including entry to Connected with Jordan Peak at Lightbox. To be followed by DAWN after hours with a stellar line up featuring Romanian duo NTFO and Hannah Holland. Last entry strictly before 3:30am! Moored boat Bar&Co is the hottest meeting point in central London with the best atmosphere and most excellent location overlooking some of the main city landmarks such as the London Eye and the Big Ben.